If less is more, is more less? This week everyone is crazeeeee about the whole “Black Friday” thing. Every time I turn on the TV or open a newspaper, the advertising is exhorting me to buy, Buy, BUY! 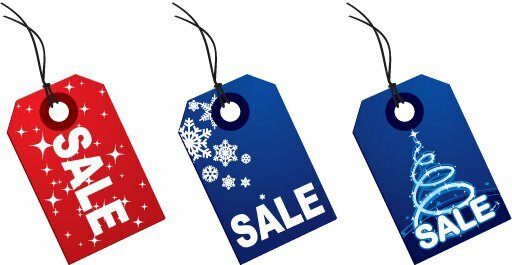 Stock up for Christmas, get a great deal of a new piece of equipment, spoil myself and my loved ones. Living in a little house has completely turned this season around for us. Not only do we not want anything, we have no where to put it if we got it. So don’t give us a new TV, or even a new remote. We have too much stuff as it is. Last year we didn’t exchange gifts between the adults of the family, and we’ll do the same thing again this year. Instead we’ll get together with loved ones, have a nice Christmas dinner, and we’ll visit back and forth during the holidays. It’s low-key. We’ll decorate our homes, bake some cookies. Take a little time to unwind and appreciate what we have. So before you buy into the whole “buying” thing, think about what you really need and what makes you happy. It’s not stuff, I’ll wager. You’d probably be just as happy if you took the money you use to buy gifts and just gave it away to charity. Happier, even. Remember, you probably don’t need more of anything. In his book, Billionaires: Reflections on the Upper Crust by Darrell M. West , he points out that rich people aren’t happier than poor people, they are often more miserable. Because what they really want is “more”. Not long ago an enterprising professor at the Harvard Business School named Mike Norton persuaded a big investment bank to let him survey the bank’s rich clients….In a forthcoming paper, Norton and his colleagues track the effects of getting money on the happiness of people who already have a lot of it: a rich person getting even richer experiences zero gain in happiness. something in the world has changed—or is changing. And I think it is: there is a growing awareness that the yawning gap between rich and poor is no longer a matter of simple justice but also the enemy of economic success and human happiness. It’s not just bad for the poor. It’s also bad for the rich. It’s funny, when you think about it, how many rich people don’t know this. This is the time to say no to more consumerism. Posted in Laneway House, Minimalism and tagged Lane Home, Laneway House, Minimalism. Bookmark the permalink. 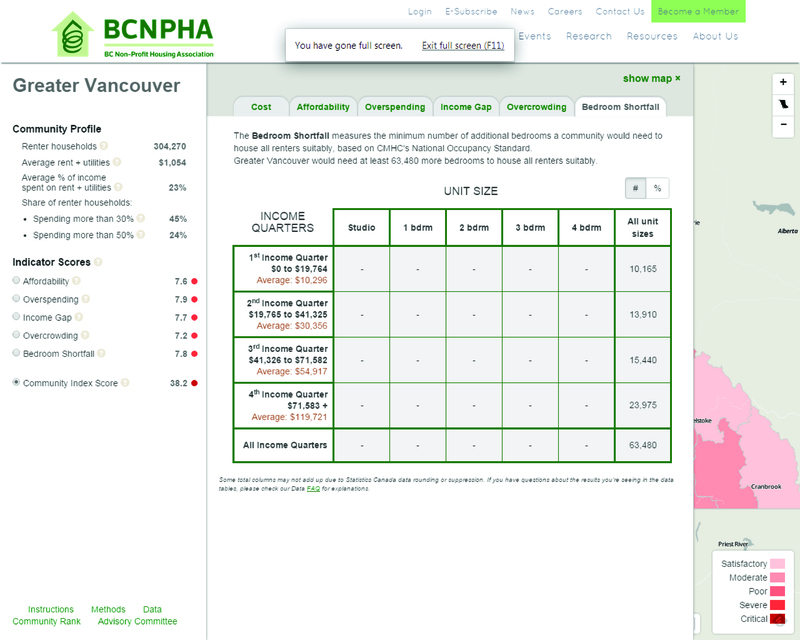 For someone who sticks their nose into all kinds of housing, it’s incredible to me that I just recently learned of the BCNPHA — The British Columbia Non-Profit Housing Association. The BC Non-Profit Housing Association provides leadership and support to members in creating and supporting a high standard of affordable housing throughout British Columbia. 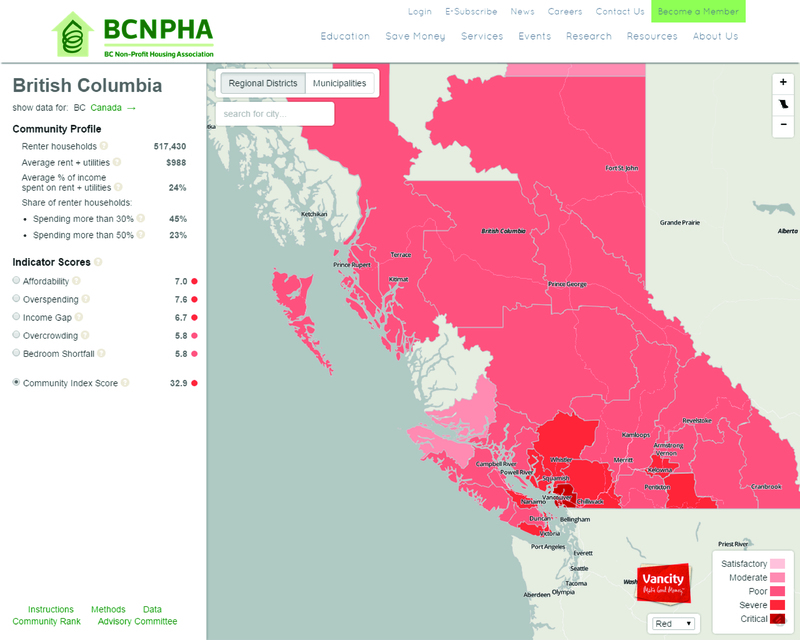 BCNPHA members are primarily non-profit housing providers. Other members include individuals and organizations who care about affordable housing. If you are interested in providing or living in non-profit housing, these are the folks for you. They offer training and help at each stage. Greater Vancouver would need at least 63,480 more bedrooms to house all renters suitably. Even at the highest income level, $71,583 +, renters might not find accommodation suitable for their needs. 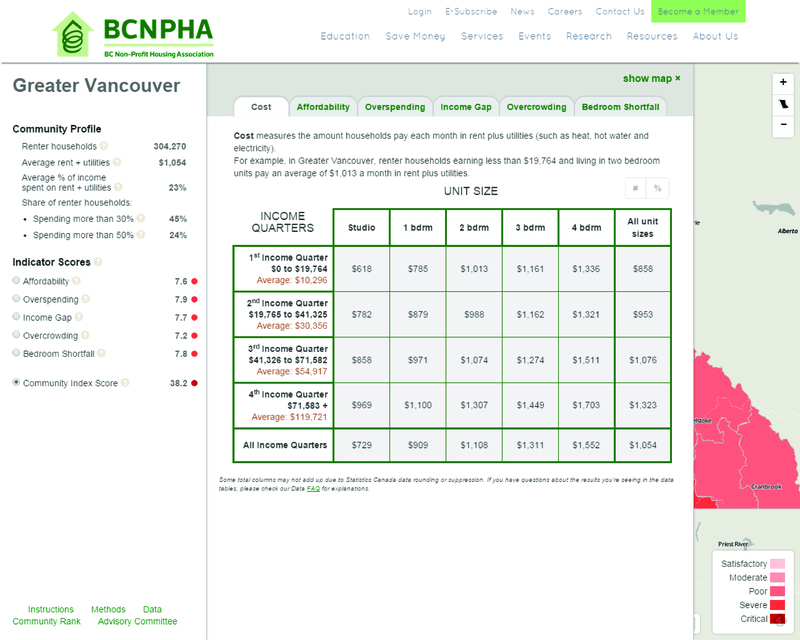 We just had a civic election where the term “housing affordability” was tossed around by all sides.These figures from the BCNPHA show just what that term means in hard figures. Posted in Housing, Laneway House and tagged Laneway House, Rental housing. Bookmark the permalink. Whether you say piccolo, pequeño, pieni, klein or petit, small is beautiful all over the world. 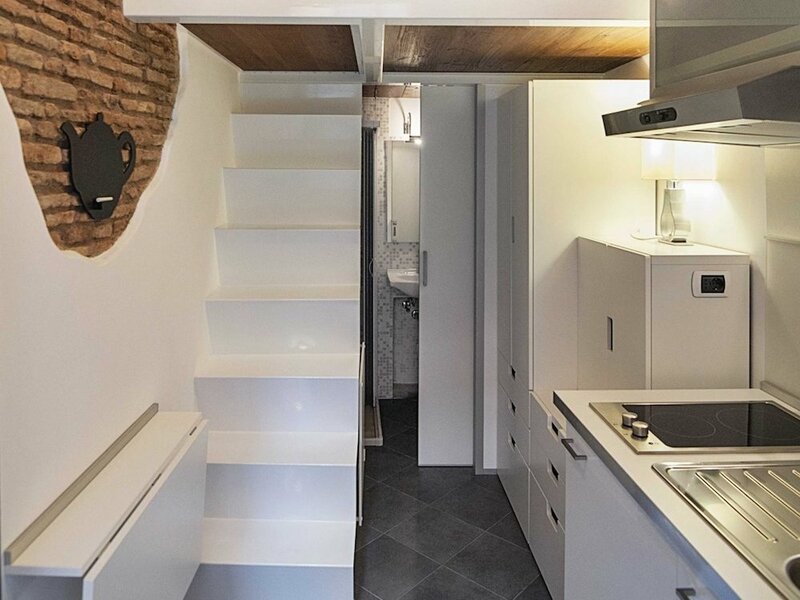 These little homes in Europe packed a lot of style — and innovative thinking — into small spaces. 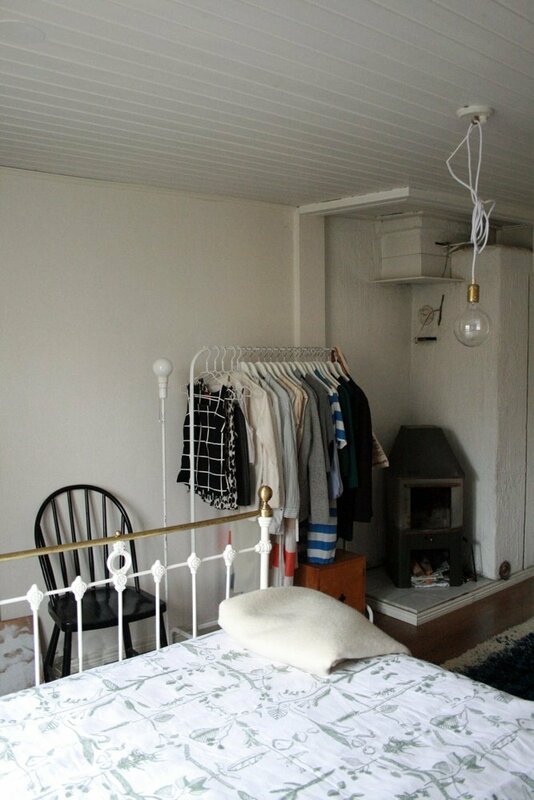 See how many ideas you can use in your small space. 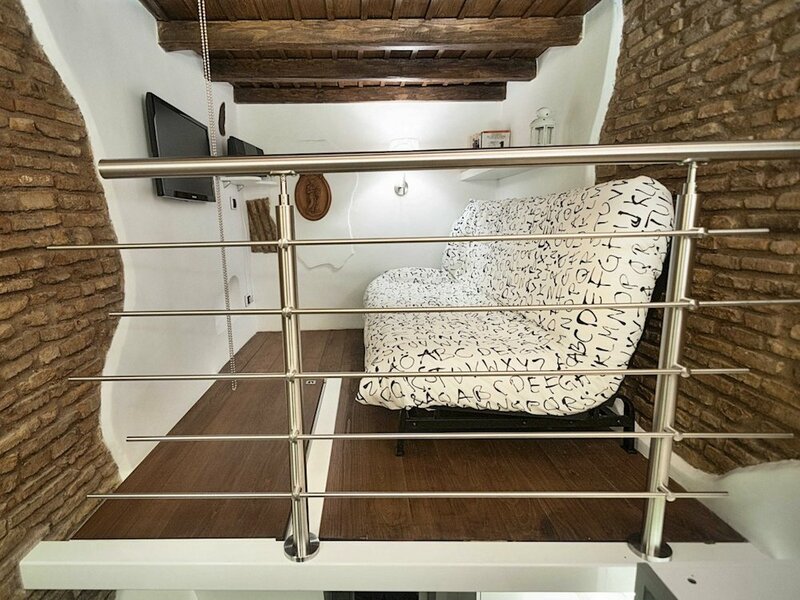 A comfortable loft-style home big enough for two (if they can control their shopping urges) built in the space between two existing buildings right in downtown Rome. And a fair-sized kitchen. The table folds away when not needed for eating (or working with a laptop). It looks like they used the exterior walls of the neighbouring buildings as part of their decor! 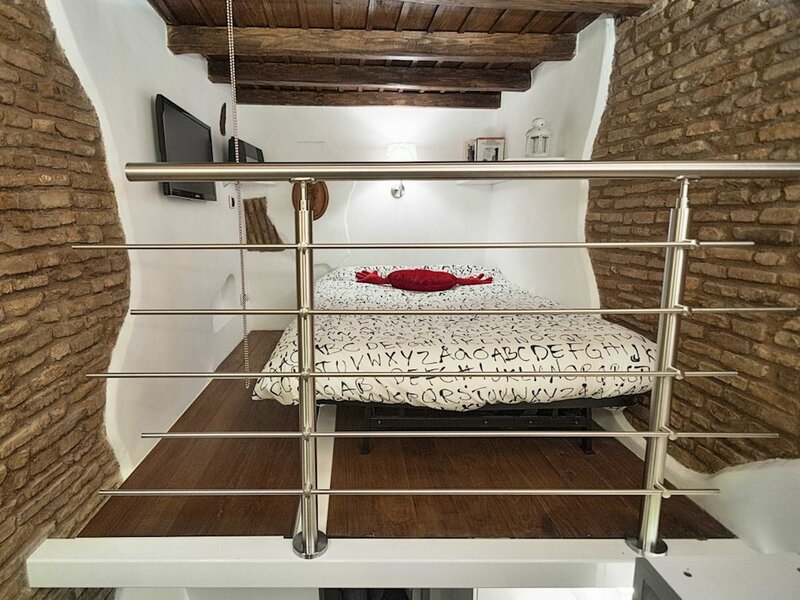 With the brick, the plaster, and the exposed beams it looks like it’s been there for centuries, yet still clean and modern. I myself am not crazy about the chipboard, it looks too unfinished to me and I wonder if it’s tough enough to stand up to all that manhandling over the years. But the space itself is very nice. And the moveable walls mean you can use the same space is many different ways. How much would you love to live in the heart of Paris? 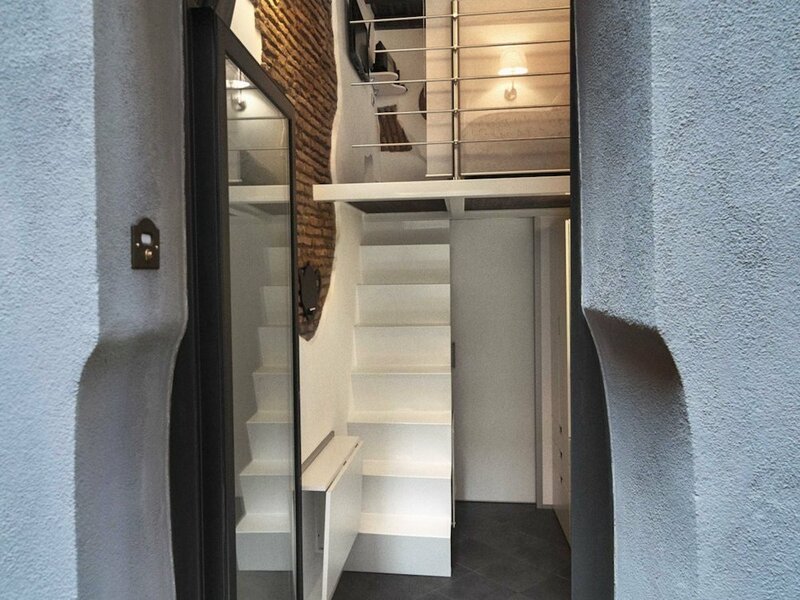 Enough to live in a 7th floor walk-up? 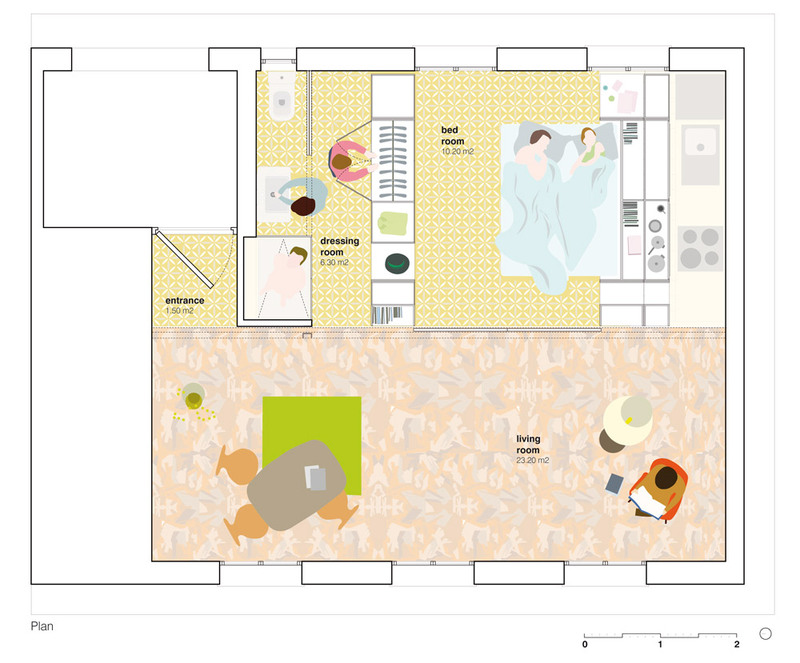 In 8 square meters (86 square feet)? It’s so chic! And easy to keep clean. It was planned to be home for an au pair for a family in the building, but it would be perfect for a student or working person, too. I really like the interior window that lets light into the bathroom. 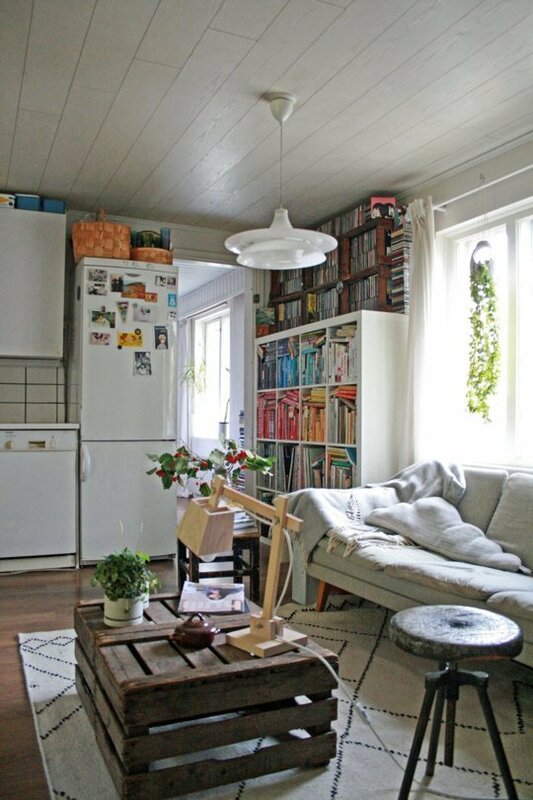 And the stairs/shelves is a great dual use of the same space. But what about if you want to get away from it all? 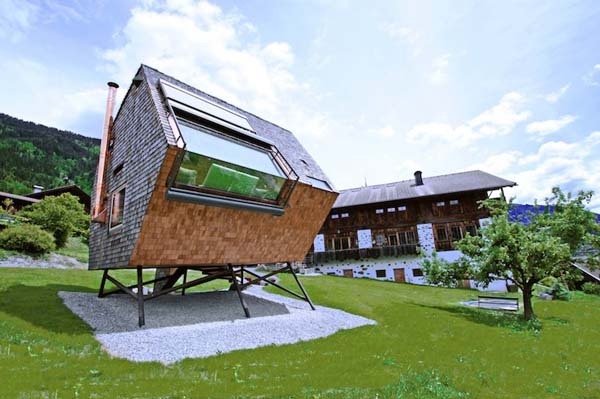 Small spaces are fine in the city, but how would a small home fit into the wide open vistas of the Austrian Alps? Perfectly. 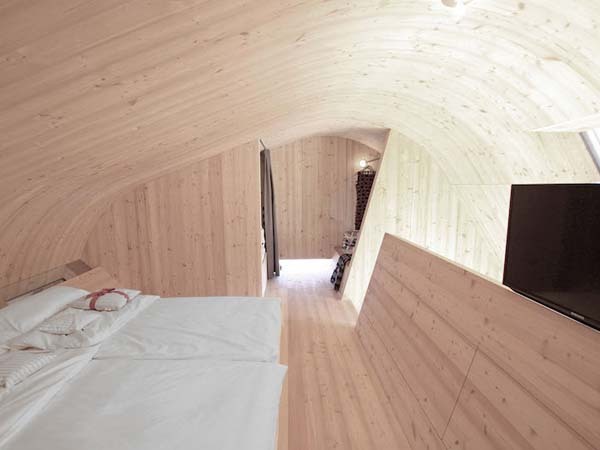 Once again, design trumps space, here in this charming and compact vacation home. It’s called the UVogel. 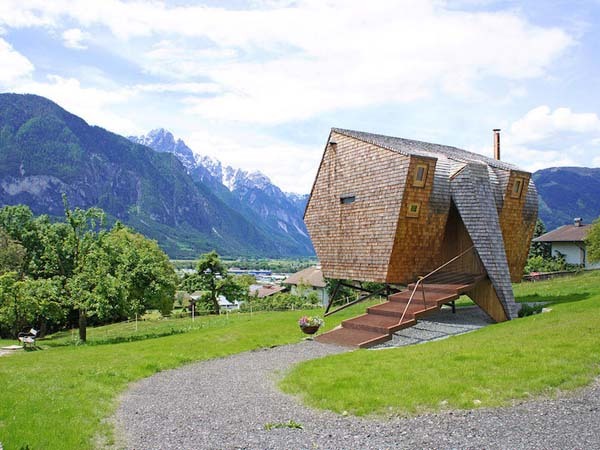 And it’s for rent if you want a taste of perching on the side of a mountain in your own cozy nest. 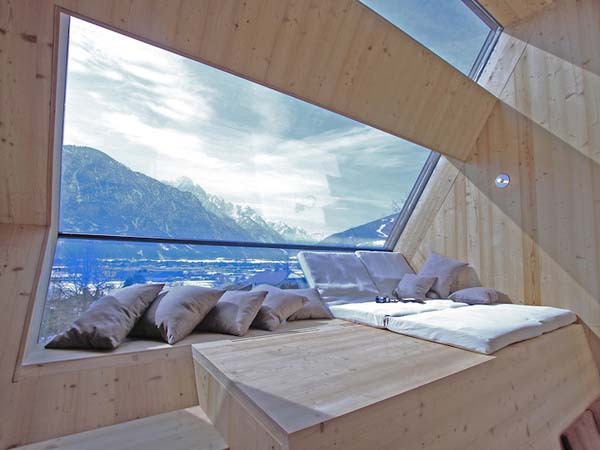 Building a platform to use as a lounge area is the ideal way to grab that view and hold onto it for hours. Once again, bench seating gives you extra space in the dining area. They seem to have installed the TV so it can be mounted on the other side of that half-wall and viewed from the main room, or pulled up atop the wall for bedroom viewing — that is tricky! 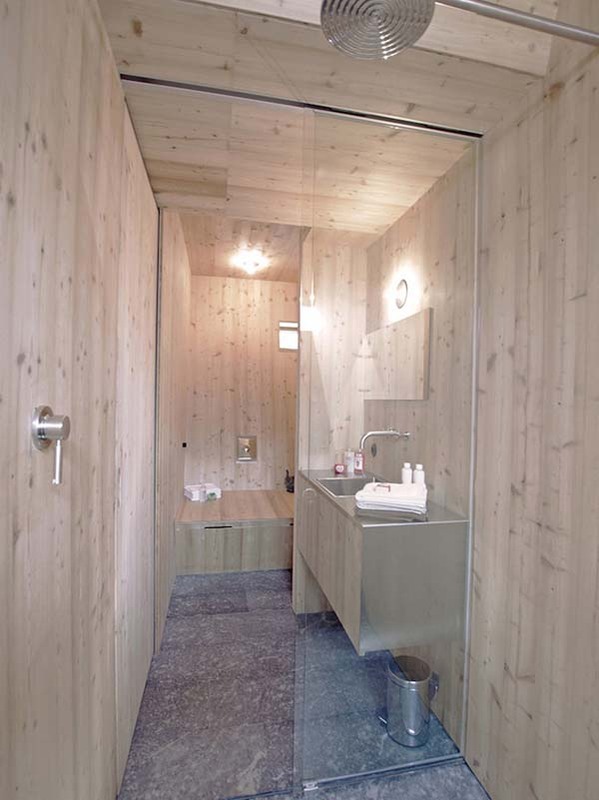 And the bathroom is built in a deep, narrow space. 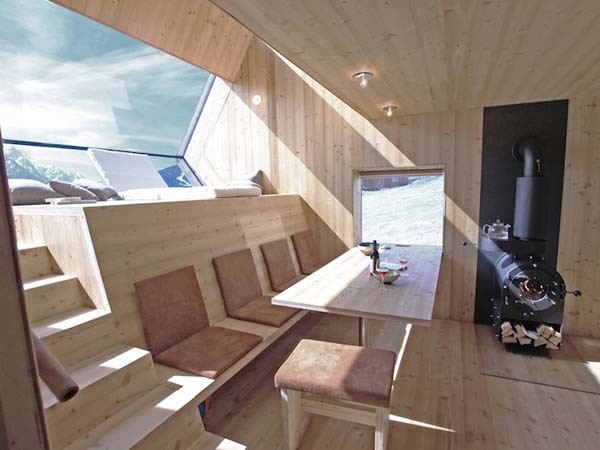 The glass walls allow the sun to come all the way into this tiny cabin. What about if you’re looking for something a little more old-fashioned? How about this adorable little cottage in Finland? Just 516 square feet, and 120 years old. Apartment Therapyalerted us to how much cute you can pack into that little area. The kitchen and sitting area are in one room. 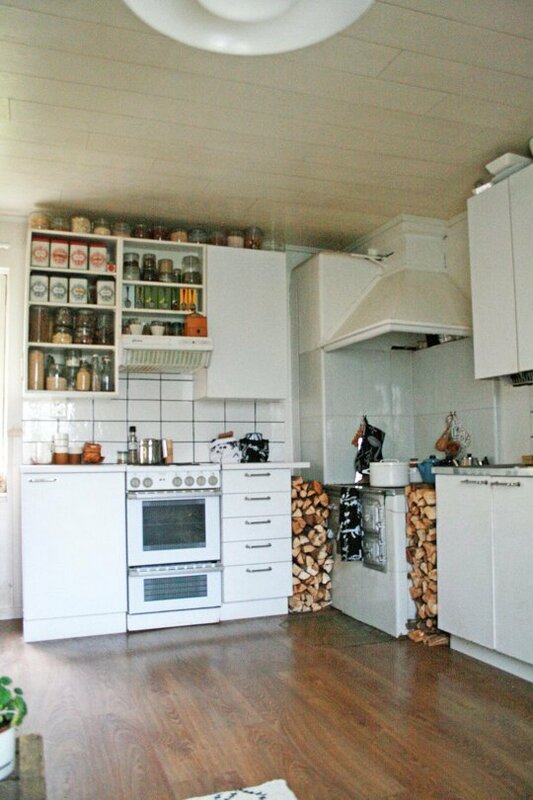 It looks like they have some kind of radiators under the windows, but the kitchen has a nice old-fashioned wood-burning range as well as a modern electric stove. 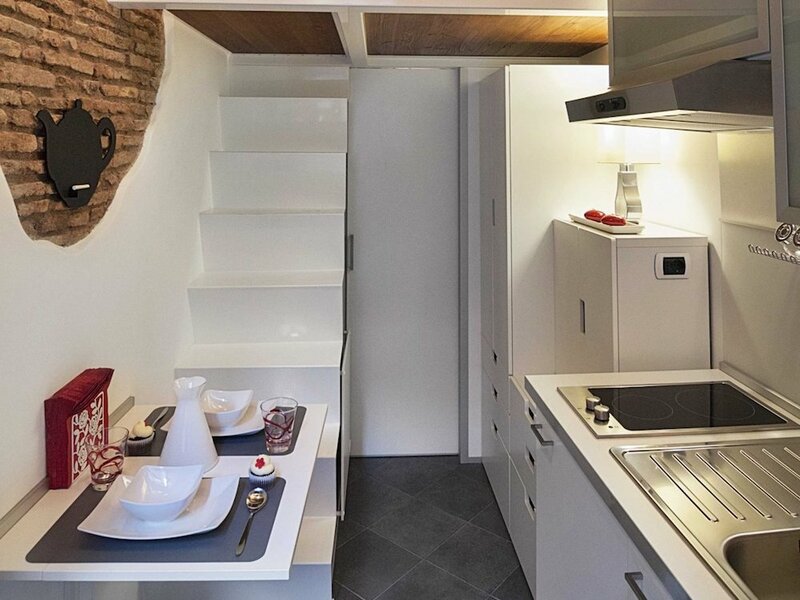 Using every square millimetre of vertical space gives you maximum storage. And the bedroom has a small stove as well. I understand it can get quite cold in Finland, so they probably need all the help they can get to keep warm. Thanks for joining us on our trip around the continent of Europe. Please return your seats to their upright position and make sure your seatbelt is securely fastened. And remember — thinking big and living small are the way to fly! 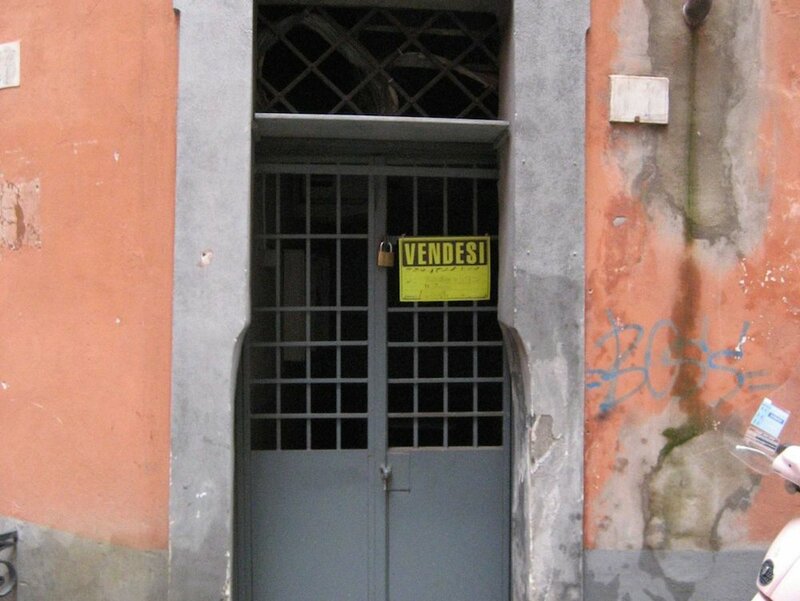 Posted in Decorating, Housing, Laneway House and tagged Europe, Life Edited. Bookmark the permalink. Sorry I’ve been away so long, but I have been battling the worst cold in captivity and the outcome was in doubt for a while. So instead of writing blog posts I was reclining on the sofa trying to look pale and interesting and coughing so much I sounded like the last act of Camille. But some good came from all that. During the past few weeks I’ve learned to appreciate my little kitchen all the more. I know that everyone who cooks wants to design their own kitchen — they truly are the heart of any home. When DH and I were talking with our designer about the upper storey of our laneway home we made it clear that most of it would be dedicated to the kitchen/eating area, with just one comfy couch for us to sit on and read or watch TV. I would love to take credit for the design of the room (hey! I spent months putting stuff up at Pinterest!) 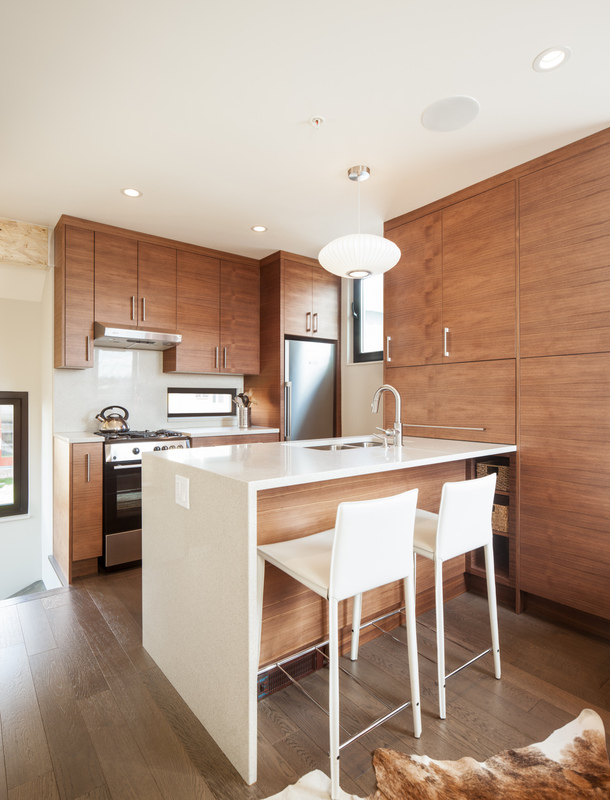 but of course it was our designer Laurel from Novell Design Build who took all our ideas and fit them into our dream kitchen. That’s the view if you’re standing in our door to the deck. Now let’s look at every reason I love my kitchen. 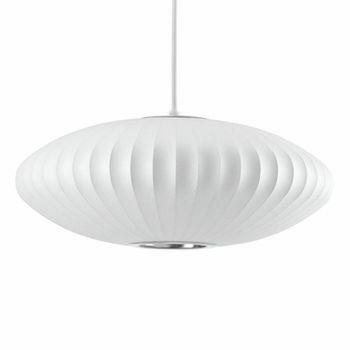 First, it’s the lightness of the room. The picture was taken on a fairly bright day, but even on the gloomiest of cloudy days there’s still a lot of light in the place. It comes from the potlights in the ceiling, from the windows, the doors. In the kitchen area there are two windows, the one you see in the top picture that looks out over a section of green roof, and the little window placed on the north wall between the counter and the top cupboards. It’s a tiny window but it helps give the space such an airy feeling. The quartz countertop also adds to that airiness. It’s not just the expanse of the peninsula, making our eating area and waterfalling off the side. The same quartz is used as a backsplash behind the stove and around the window. It sparkles and gleams, reflecting even more light into the area. I could write a sonnet about our cupboards. We chose everything, from the finish to the hardware to the interiors. We went out to Pacific Rim Cabinets with Laurel to talk with the people who would be building them. They provided us with a couple of options as far as configuration goes, and we fine-tuned the final result. I love slick white cupboards, but since the room is also our sitting area we wanted to get the idea of warm wood walls into the space. One way we keep the counters clear of clutter is our wonderful appliance garage. Counter-top appliances that formerly stood out in the open can be whisked behind a smooth-closing door when we are not using them. 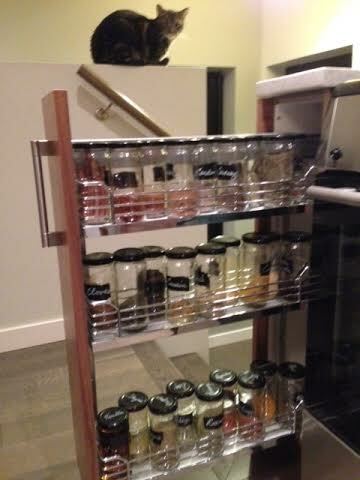 We had long-dreamed of a spice cupboard that would keep all our spices nice and tidy but close to hand. I saved up all our old martini-olive jars, which volume-wise are just right for holding one of those bulk spice bags from the market, but they are a bit chubby for our purposes so we can’t fit enough jars into the sliding shelves. I’m always on the lookout for a substitute but haven’t found one yet, so we’ll keep using the jars we have. One thing we insisted upon was that we wanted drawers rather than cupboards for our under-counter storage. 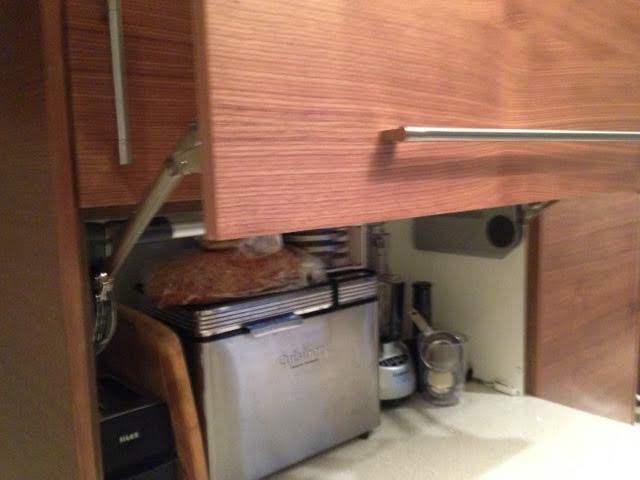 We even wanted a drawer under the sink, but it wasn’t feasible. So we still have doors that open but we do have a drawer within that nicely holds our garbage, recycling basket, and compost bin. And, right across from our little dishwasher, a drawer for our dinnerware. 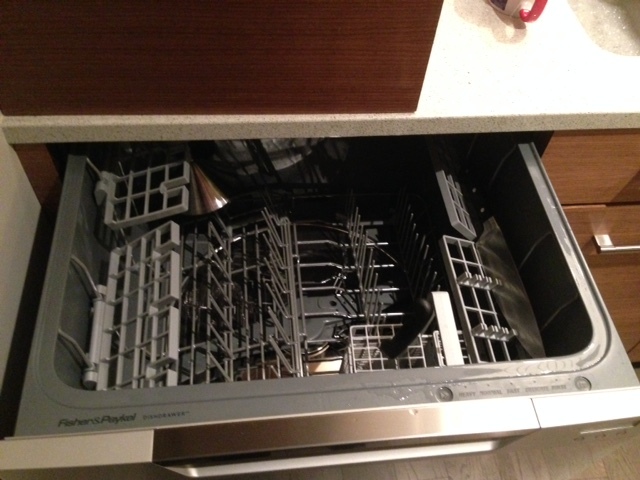 Having the dish storage so close to the dishwasher means unloading takes less than two minutes. 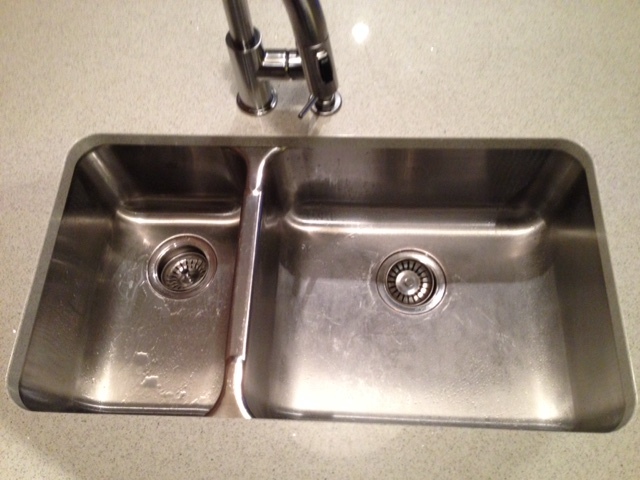 Even though we knew we were sacrificing some precious counter space, a double sink was something DH and I insisted upon. We had truly suffered when we were at our interim rental with a single sink, and we were so relieved to get our lovely double sink. Of course I love our gas stove and our little fridge/freezer. It’s true we can’t stock up for the zombie apocalypse with such a small fridge, but we appreciate the almost-daily walks to the nearby Superstore to buy just what we need. And the stove is really easy to clean, the oven racks come right out to leave completely smooth walls for scrubbing. And the dishwasher is exactly the right size for two people. In fact, some people buy two small dishwashers. One for daily use, and one for when they have company. Saves water and hassle. Keeping the floor clean is easy, too. We can sweep all the kitchen mess that lands on the floor (curse you, gravity! you win again) into the baseboard vacuum. Just a flick and it’s all sucked away. And if you glance at our ceiling in the first photo above you may see the speaker for our sound system. DH wanted to be able to hear music throughout the house but didn’t want to have speakers cluttering up the sightlines. So we had a system installed with speakers in our bedroom, the office/studio, and in the kitchen. Now we can all listen to one thing (if we have a party) or each room can be tuned to something else. Now you may be thinking that we had no input into the decorating of the room, but that’s not so. First of all, we did decide on all the finishes, even though we were helped by our designer. And we chose the lights. 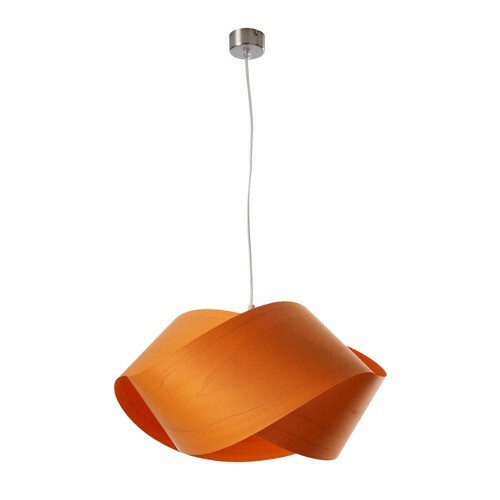 We wanted a nice sleek mid-century feel to the room and the lights show that sensibility. There’s the saucer light over the peninsula. And over the stairs by the back door there is a handsome nut lamp. Please feel free to take any ideas and use them as you will. We love our kitchen, and you should love yours. Next year when the big house renovates their kitchen expect a hammer-blow by hammer-blow description. 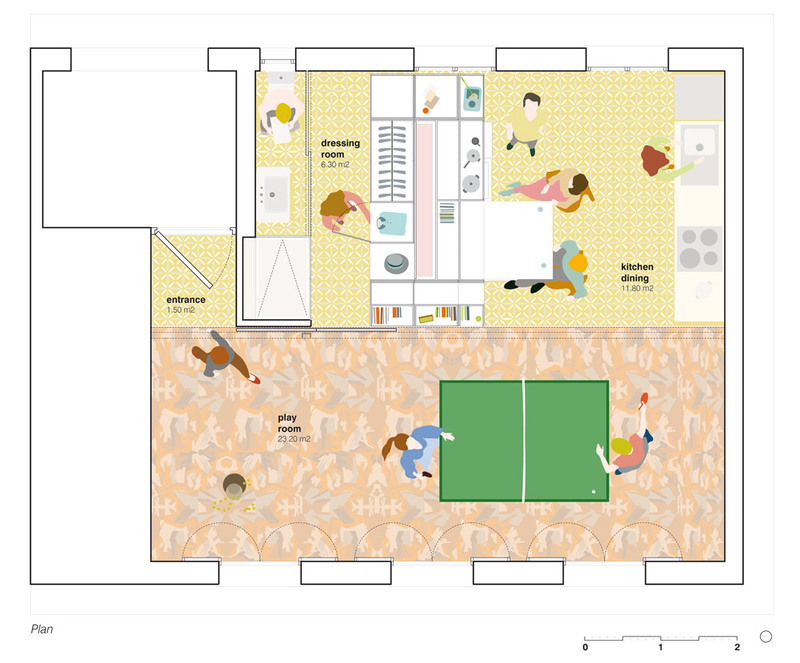 Posted in Decorating, Laneway House and tagged Kitchens., Laneway House. Bookmark the permalink.